"This Is the second test Dave & I have co-managed at Roger & Di Vincent's home in Devon. The sun shone for most of the weekend, with frosty mornings making for ideal weather conditions for our draught test. Unfortunately there were no entries in L4, All the other levels went ahead, the terrain certainly inspired the judges & tested the teams at every level. On Saturday afternoon we held an 'introduction to nose work' session, all present at the test joined in and thoroughly enjoyed trying out this forgotten discipline, the dogs certainly enjoyed tracking down the sausages! Maybe in the future we can look to reviving the nose work tests, if there are sufficient people interested. We would like to say a big thank-you to Roger & Di, for once again trusting us to run a draught test at their home, to thank Bev Clarke for yet again volunteering to sort out the catering and for not shouting at me when I forgot the kettle! to all our judges, stewards and to all who travelled from far and wide not only to take part but to just visit to see what is expected of them and their dogs at a draught test. We hope they were inspired and we will see them again at one of our forthcoming working events. Well done all who entered most were successful, the few dogs who unfortunately failed seemed to enjoy the whole event, Dave & I hope you all enjoyed the weekend." "We had 7 entrants today, all did excellent control sections, as good as I have seen in higher levels. The venue is very good for carting and I hope you will be able to continue to use it. Thank you to my fellow judge and test managers and not forgetting the wonderful catering by Bev and hospitality from the Club. " "All seven teams achieved a very high standard at this lovely venue. Well done to you all. Many thanks to Roger and Diana Vincent in allowing this event to take place at their home. The weather was also very kind to us with a dry weekend and no mud underfoot, which is an achievement for an event in this country in early March. I would also like to thank Jen Lewin, my co-judge with her help and experience and making my first judging appointment one to remember for all the right reasons." Haylock's Shallowseas Splash Dance "Shea"
"Two teams entered, one team passed, the other had problems with the backup and was unable to complete the required distance, otherwise was a really good control section. The other team did well, but lost marks on the off lead - a little more work needed but did enough to carry on. 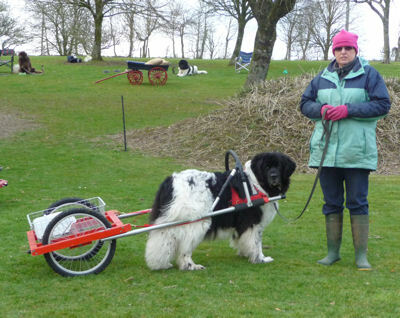 The venue is ideal for all terrains and can offer a lot of challenges for both handler and dog to really work together. The team that went on the haul worked really well, the handler giving his dog the best route and also letting the dog find his own way working from the back of the cart. Well done. Thank you to my co-judge, test managers and Bev for the catering." "An enjoyable day to judge - no rain, but a bit chilly! We had nine dogs, eight passed and one fail. The dogs, some of whom had never done a draught test before, reached quite a high standard, however a couple need more training before they progress to the next level. The dog that failed was not handled by its owner, but despite this, the dog made a good attempt! I would like to thank Pete Lewin for all his help, advice and support during my first judging appointment and for making it such an enjoyable experience. Good luck to all these dogs in the future." "10 entries all passed, no real outstanding passes, but with practice all teams will move through the levels. Well done to the entries, Dave, Kay and everyone who contributed to the weekend. Excellent!!!! " "Beautiful Spring morning at Roger & Di's home. We had 2 entries, one lovely pass and one unfortunate fail in the control section, but the dog went on to complete what would have been a pass. Thank you for all the attendant stewards and entrants. Thanks to Roger & Di for allowing us to use their home."